This is my first make from the fabrics I got from Guthrie & Ghani that I mentioned in this post. 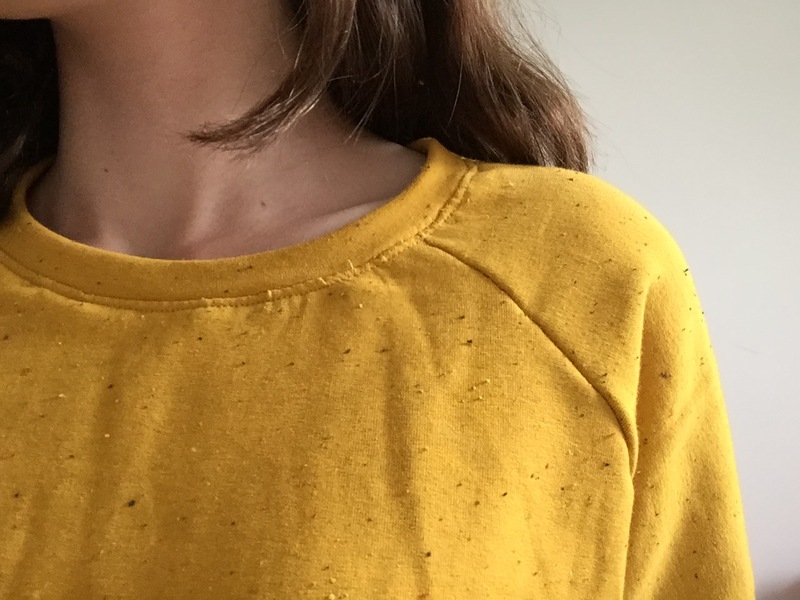 It is the Grainline Studio Linden Sweatshirt... And I'm in love with it! I absolutely love everything about it: the colour, the fabric, the style, the fit. It was such a quick and easy make and I'm very happy with it. The fabric that I used is a gorgeous mustard knit fabric, which is perfect for the pattern. 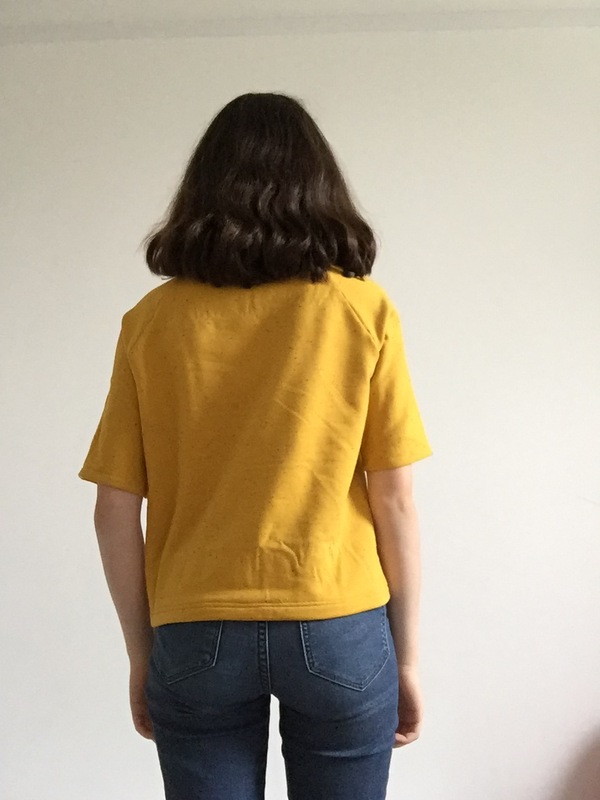 As you may be aware, mustard and navy is my absolute favourite colour combination right now, and I am shamelessly wearing outfits of those colour in constant rotation. This jumper is the perfect edition. What makes this pattern special are the raglan sleeves, which I really like. The pattern comes in two views (I chose view B). 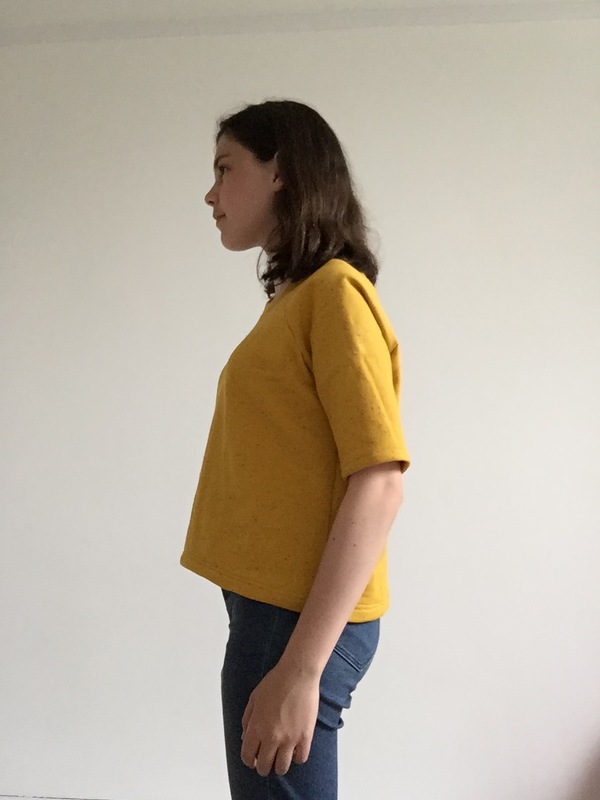 You can either decide to make a classic sweater, including cuffs and ribbing, or more of a top, which is slightly cropped and has shorter sleeves. This is the only version I've tried out so far, but I'd like to make the other too sometime. I really like the neckband on the design too, I'm always looking for different techniques to try out. Sewing the neckband in this fabric was really easy, so I was happy to have started with this one, as I have also made one for my Mum (which I will blog soon!) which used much stretchier jersey and so was a lot harder to sew. Another thing I love about this pattern is the hem-line. I love a good high-low hem (as you may know from this top) and this pattern is perfectly design to sit in exactly the right place. I really like the side view of this jumper, the hem looks lovely. To finish off the hem, I sewed a double row of stitching. I love double stitching, and I don't mind taking the extra time to sew it twice rather that using a twin needle. Although I would like to try one out sometime, I didn't bother with the extra expense, and I have also heard that they aren't always accurate. I do need to test out a twin needle though to find out if this is true! 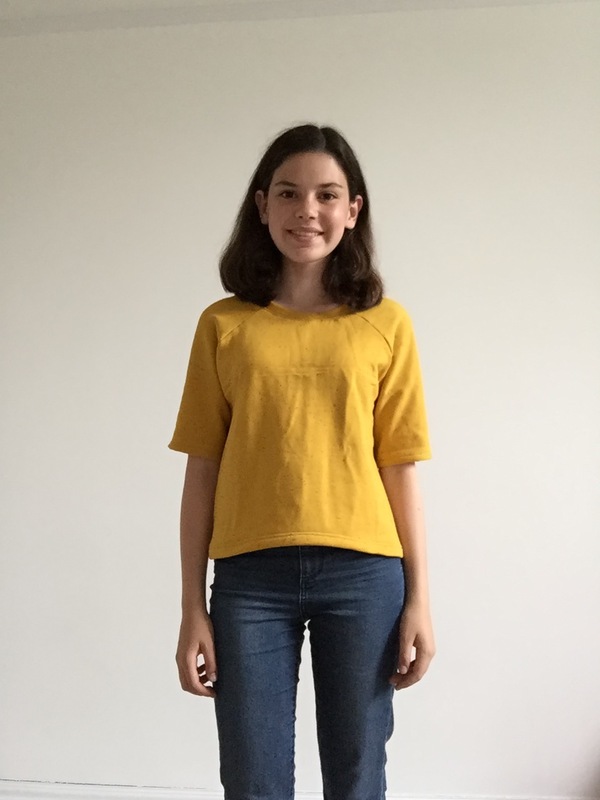 Overall I'm really pleased with this super simple and speedy sew! The Linden Sweatshirt is almost certainly going to be a pattern I use over and over, the shape is so lovely and it's just so quick and easy to make. Have I mentioned I love this fabric?! Although it's not coming out in the pictures, it actually has flecks of red and blue on it as well as some different textures, which adds a lovely twist to a classic colour. This is definitely going to be getting a lot of wear! Oooooh that colour! Really love the yellow. I have always been a bit afraid of sewing with jersey fabrics or anything with stretch, but your handling of this is excellent and makes me want to try again. Lovely work! I think that this fabric is perfect for starting with stretch as it's really easy to handle. Once you get the hang of sewing with jersey you won't be able to stop! Thank you! It's such a great pattern to have, it's taken me through many seasons! I still haven't tried the twin needle, but I will defititely bear basting in mind for when I do, thank you! I love it! It looks so cute and definitely on trend. Thank you for the review because this would be perfect for my girls too (and me)! Your blog post is so well written and your photos are very nice. I've made lindens for both my mum and for me, so it is a good pattern for every age category! Thank you so much. It looks fantastic! That fabric is lovely too - great job! It's exciting when you find a pattern or style which suits you well and you feel both comfortable and happy in it. Mustard teams so well with navy.